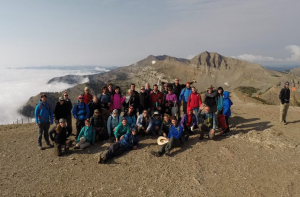 Nicky Wright recently attended the 2-week graduate summer course ‘Mountain Ranges and High Plateaus‘, held at the University of Michigan’s field station in Wyoming. This was only the second time the University of Michigan has held this course, which featured instructors from five other U.S. universities and international and U.S. graduate students from both the earth and atmospheric science disciplines. This intensive course focused on the interaction between geodynamics and climate, including field trips to the nearby Grand Teton and Yellowstone National Park, and highlighted the need for more interdisciplinary research.